Unfortunately, cornershop, I still can't see them. Are you downloading from Photobucket? Arthur causes mayhem in the Snelling's department store. Testing his braces and waistcoat for snapping is onlooker Syd Crossley, who IMDb has down as "Policeman"
And when Frances Day makes a suggestive remark about toffee apples to store owner Mr. Snelling (Sebastian Smith) in a film with quite a few double entendres, Ian Selby needs to look round at the camera. In charge of the blackmail, er, film is the exhausted Peter Haddon, while the cameraman centre looks very like the inexhaustible John Harvey. Last edited by philly; 2nd April 2017, 07:18 PM. Hmm, difficult to say, philly, looks somewhat chubby-faced to be Janina. And there's the top brass at work too: familiar faces, including Ernest Blythe as none other than Air Commodore Whitehead (as opposed to Skinhead). But his colleague P.C. Colin McKenzie is happy just to stick his considerable nose in the air as Anne Aubrey totally ignores the fracas all around her. Looking back at Look Back in Anger, I would mention that among the market crowd during the stockings stramash is Horsey Face. Last edited by Tigon Man; 4th April 2017, 01:48 PM. Ernest Blythe as a functionary seeing PM Ronald Fraser off on his US trip. Guy Standeven at a reception at London Zoo. Maxwell Craig is on hand to record it all as a photographer. Last edited by Tigon Man; 4th April 2017, 01:53 PM. Is that the prodigious nose of Reg Thomason protruding from the right? I wondered if it was Reg and his bugle as well Gerald. Sadly this is the only image available, as a second later Reg? is blocked by a reporters furry microphone. The image of the hooter blow up to full size doesn't help much either. Personally I'm not convinced and if it is Reg, he's borrowed Cy Town's bins. Well, just to confound matters even more, the film is on both Reg's and Cy's lists! I am. Inexplicably, my Recent Uploads page was full of "moved or deleted" images when I logged in. I've just re-uploaded some of them (they're back at the 'Beginning Is Nigh' and 'Paintings in Films' threads) but I'm worried they might disappear again. I notice you're posting screencaps directly from your computer rather than Photobucket. Have you had the same experience? 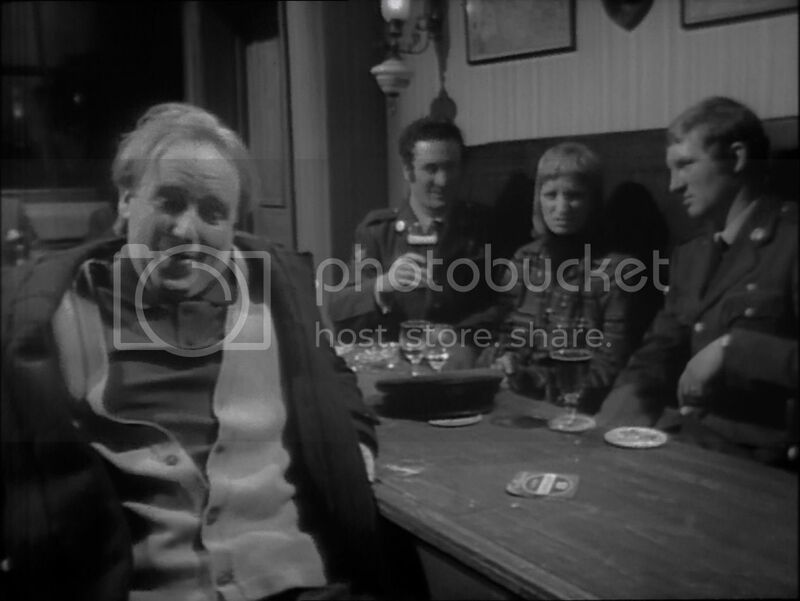 A drunk George Waring is at The Red Lion pub. The uniformed man on the right is Steve Ismay.I now doubt that his colleague is Richard Eden but he does look familiar. As for the girl, I wonder if she's Felicity Balfour (an early member of Pan's People who was a party guest in the slightly earlier Public Eye episode Shades of White)? Last edited by cornershop15; 4th April 2017, 08:35 PM. Personally I've given up on Photobucket these days Cornershop, and always use my own screencaps direct from my computer. Photobucket is so chock full of ads and other rubbish, it's almost impossible to use.